Our next stop of the day after the market was Asakusa, an entertainment district in Tokyo. 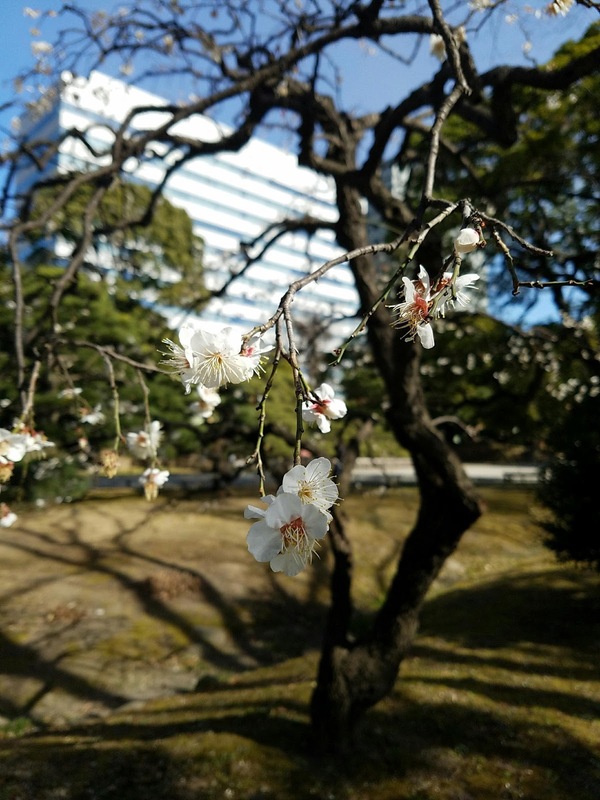 We hopped on a boat to get from the Tsukiji Fish Market to Asakusa through the Hama Rikyu Gardens with flowers already in bloom. I can't imagine what it would've looked like a few weeks later! The boat ride took us past several bridges located in Japan before we made it to Asakusa. I wasn't sure what to expect there but I immediately fell in love with this cute district! There were a bunch of food and gift stalls along the streets and of course the tourists to match. View of the Asahi Beer Tower & "Flame"
1) Konpeito - Also known as sugar star candy that's colored in pastel shades in a light bulb! I haven't had these particular ones but I enjoy how cute and little these are! They're basically like softer rock candy, but having they're such a novelty (The soot ate them in Spirited Away!). 2) Kinako Dango - Soybean powder coated over fresh made sweet rice flour dumplings. These were so small and again, so cute. They were nice and soft with a little bit of chewy texture and not overly sweet. The generous coating of the kinako made it even more enjoyable. 3) Sakura Soft Serve - Cherry Blossom flavored soft serve ice cream (think cherries and some shiso!). There were tons of ice cream places here and I found a place that stood out to me with about 20+ flavors including melon, soda, purple potato, and more! It was hard for me to pick a flavor but I had to go with the Sakura/Cherry Blossom and I loved it. Id reminded me of the Sakura Mochi from the Tsukiji Market earlier in the day. 4) Roasted Senbei - Freshly roasted seasoned rice cracker. This was one of my unexpected favorites at the market since I only tried it because I kept seeing people come up for it. It was located in the same stall as the ice cream shop above and since you can't eat out on the streets between the stalls (they're super big on keeping everything clean!) I just decided why not just keep eating here?! 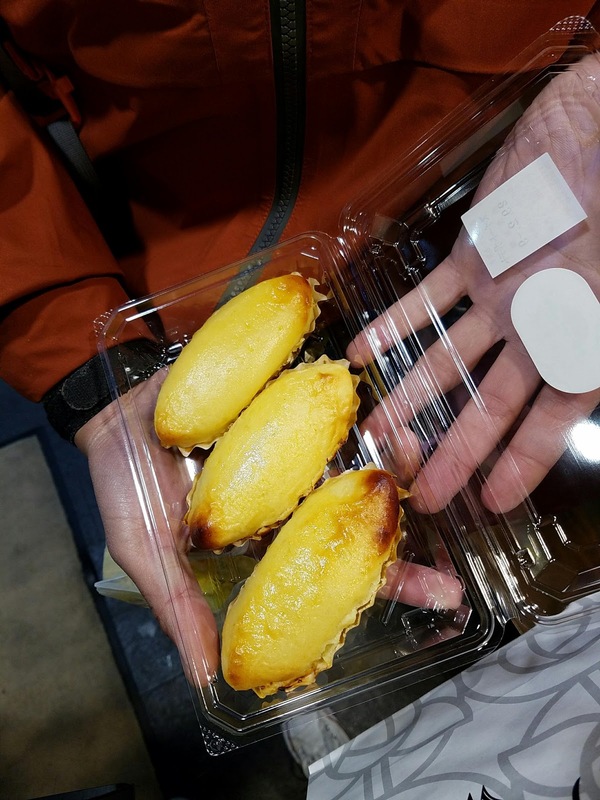 5) Cheese Tart - Found a stand that had these cheese tarts but thought they were just so-so. It was flavorful but definitely would have been better if it was warmed. 6) Matcha/Green Tea Cream Taiyaki - We stumbled upon this Taiyaki shop after we saw the cook making them through the window. I'm usually not that into Taiyaki since they're usually filled with azuki (red bean) but this one offered variations of creams and when I saw the green tea one, I had to have it! By far one of the best green tea items I've ever had with a strong green tea flavor that wasn't bitter or overly sweet. Delicious! 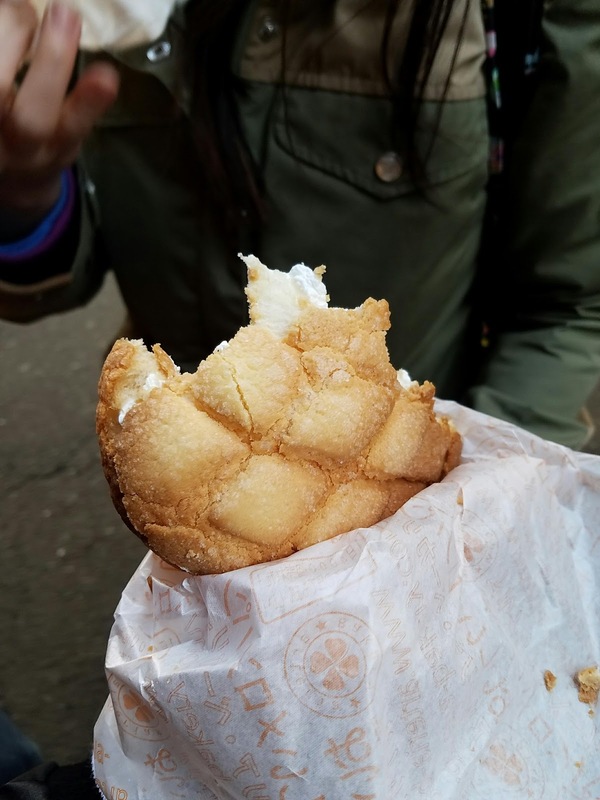 7) Melon Pan - Freshly baked melon pan/bread with a nice crunchy crust. There's no actual melon flavor to it, but it's the shape of it that makes it look like melon. These were baked fresh by this cute little old lady who was selling them also filled with cream (whaaa?) but we opted for the original one. They were way bigger than the ones that come frozen in the states and was just really good for a sweet bread. 8) Sweet Potato Dumpling - This tasted straight up like a cake but it was made only out of sweet potato and probably a binding ingredient, that's it. The texture wasn't like a typical steamed sweet potato and it was incredibly rich, dense, and flavorful. Another unexpected favorite! 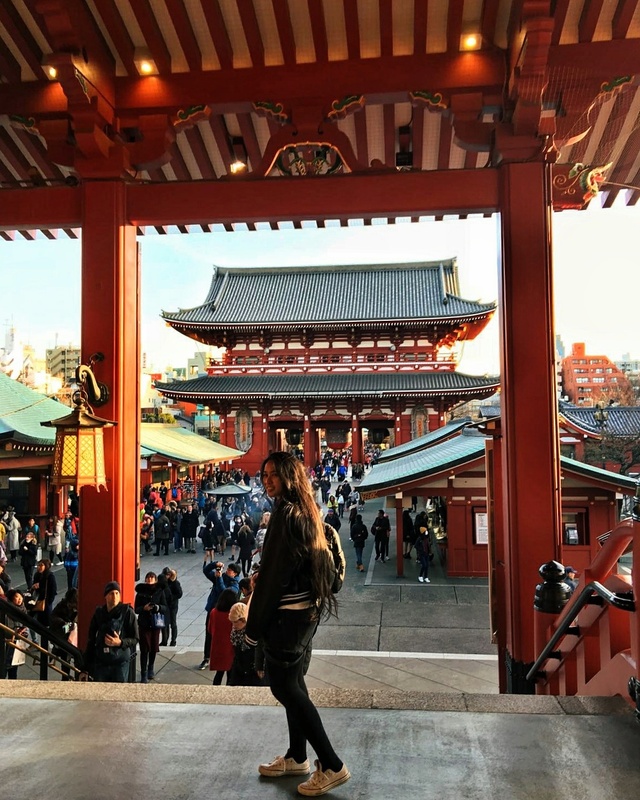 I hope you enjoyed this photo diary and get some inspiration for traveling to Japan! Asakusa is such a fun and entertaining district in Japan filled with food stalls and gifts everywhere (and of course people too!). It's definitely a must see when you're in Japan, even if it's for a short visit (but I'm sure all the food stalls will distract you!). Stay tuned for my next Japan photo diary post!